Mixed by Cato Langnes @ NOTAM & BJNilsen Mastered by Denis Blackham at Skye Mastering. Photography by Finnbogi Pétursson. Much more ‘ambient’ than the spikey, threatening sonic conflict of the first freq_out CD [Ash 5.8, 2004], this second piece was featured in Frieze magazine. “Freq_Out 2” is a bit of an abnormality. Given the fact that laptops are common music-making tools, it’s still rather infrequent to see an orchestra of laptops given a cohesive performance. Swedish artist CM von Hausswolff assembled an all-star cast of laptop/electro-acoustic devotees [these people were actually artists, architects, composers, producers, sculptors, etc.] from around the world [Kent Tankred, Maia Urstad, BJNilsen, Jacob Kirkegaard, Brandon LaBelle, J.G. Thirlwell, CM von Hausswolff, Mike Harding, PerMagnus Lindborg, Petteri Nisunen, Jana Winderen, Finnbogi Pétursson, Tommi Grönlund and Franz Pomassl] and asked them to play in a certain frequency range. Everything here was live and recorded onto tape as it happened. Each member of this impromptu orchestra had a workstation of a mixing desk and a PA system. Everything was then mixed and melted to create the final results. The results are certainly not the chaos you may expect. Rather calming in nature, the sounds have a flowing quality to them. Imagine you’re listening to a soft electric current with an array of fuzzy background humming and you’ll get the gist of this record. Gentle piercing of bell and chime-like sounds along with this noise that resembles a howling wind are just two images that come to mind as I listen to this for the umpteenth time. 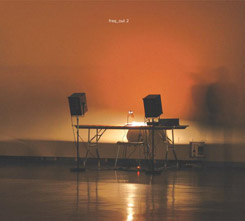 Truly effective landscape that has an ability not to overpower the listener with too much “stuff” all at once, the hour of seamless music on “Freq_Out 2” is well orchestrated and perfectly programmed. Nachdem inzwischen (am 1.10.2005) in der von Oscar Niemeyer entworfenen Zentrale der PCF in Belleville die dritte Folge von Freq_out stattgefunden hat, ist hier erst einmal freq-out 2 (Ash 6.8) dokumentiert. Das Cover zeigt den spartanischen Arbeitsplatz für einen einzelnen Knöpfchendreher. Aber CM von Hausswolff hatte im Oktober 2004 ein gutes Dutzend der einschlägig Verdächtigen für das Ultima Oslo Contemporary Music Festival eingeladen – Brandon LaBelle, Amerikaner in Kopenhagen, den als Clint Ruin, Foetus oder Steroid Maximus besser bekannten Jim G. Thirlwell, Australier mit Wohnsitz Brooklyn, mit Mike Harding (*1957) den englischen Botschafter des Königreichs Elgaland-Vargaland, der seit 1981 zusammen mit Jon Wozencroft Touch leitet und seit 1995 auch noch Ash International, den Österreicher Franz Pomassl, aus Schweden Kent Tankred (*1947), einer der Söhne Gottes, den auch als Hazard bekannten BJNilsen (*1975) und den in Paris ansässigen PerMagnus Lindborg (*1968), den Dänen Jacob Kirkegaard (*1975), Maia Urstad & Jana Winderen aus Norwegen, Finnbogi Pétursson (*1959, Reykjavik) und die beiden Finnen Petteri Nisunen & Tommi Grönlund, die offenbar als einzige als Team fungierten. Von ihnen zusammen stammt der exakt einstündige, dröhnminimalistische Soundscape, der sich mit geradezu prototypischer Ambientsublimität im Raum entfaltet und ihn mit nordischer Chillout-Atmosphäre tönt. Wobei Hausswolffs Konzept darin bestand, jedem Zwölftel dieses Quasi-Mimeo-Orchesters aus dem Audiospektrum von 11000 Hertz nur je ein Frequenzfenster von 250 Hz zuzubilligen. The orchestra is dead! Long live the new organic frequency output autocracy! Das je Individuelle geht dabei als nur leichte Temperaturveränderung, vage Farbnuance oder Duftnote im Klangbild unter. Ohne Schnitte oder Brüche fließen die einzelnen Zutaten ineinander, ein gemeinsamer Atem zieht sich durchs ganze sehr kristalline und frostig klare Stück. V podstat? podobného zvukového charakteru jako album Sala Santa Cecilia je i tato nahrávka, p?esto však vznikala naprosto jiným zp?sobem. Za vše hovo?í slova, jež u p?íležitosti festivalu Ultima Oslo Contemporary Music pronesl v roce 2004 její kurátor C.M. von Hausswolff (jež byl zárove? jedním ze zú?astn?ných hudebník? ): “Vytvá?íme totáln? nový koncept vzniku hudby. Tato myšlenka je založena na respektu, ?lenitosti a spojování. Orchestr je mrtev! Skupina je mrtva! Hudební soubor je mrtvý! … Toto je p?edve?er nové hudby 21.století!” Ve skute?nosti tu má poslucha? co do?in?ní s více mén? ambientn? zn?jící zvukovou instalací, tvo?enou dvanácti p?izvanými osobnostmi (krom? von Hausswolffa mj. Jacob Kirkegaard, J.G.Thirlwell, B.J.Nilsen a celá ?ada mén? známých Skandinávc? ), jež vznikala improvizovanou cestou výhradn? za pomoci laptop? a se zam? ?ením na ur?itou frekvenci, p?i které, jak lí?í von Hausswolff “každý detail, každá vte?ina hluku a ticha jednoduše p?ispívá k celkovému atmosférickému a emocionálnímu zvukovému výsledku, jež valná ?ást z nás chápe jako podstatnou esenci muzikálnosti”. V podstat? statický a nem?nný ráz nahrávky vyvažuje v?domé nastolení kázn?, ba p?ímo ?ádu jednotlivých zú?astn?ných. P?i jejím poslechu se totiž ani nechce v? ?it, jakýmže stylem tento hudební útvar vlastn? spat?il sv?tlo sv?ta. Nic na tom nezm?ní ani fakt, že samotný poslech tentokrát možná p?ed?í prvotn? plánovaná idea jejího vzniku.